Green Acres School was founded in 1934 by Alice Mendham Powell and a group of parents and teachers who had a clear vision about teaching and learning. Powell saw what many of us today continue to observe in schools across this country–students passively receiving information; teachers moving quickly through material to be memorized; students’ ideas, development, and prior experience largely ignored; and a disconnect between the work of school and that of the world at large. Inspired by the work of educational reformers and developmental psychologists such as John Dewey, Jean Piaget, Francis W. Parker and Jane Addams, Powell and her colleagues created Green Acres, a school unlike any other in the Washington area. These progressive-era and early-20th-century thinkers and activists believed society’s well-being depended on schools giving children the skills and insights needed both to pursue their passions and to improve society. They viewed school as an engine for social change at a time when the world was changing as never before. 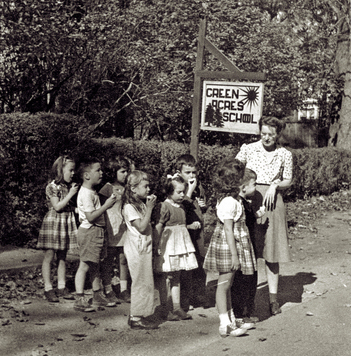 Green Acres was established as a place where children of diverse backgrounds formed a community to learn from everyday experiences and make connections between school and the larger world. The founders believed children are naturally curious and learn best in a comfortable, flexible environment. They established small classes where everyone’s ideas, even children’s, were listened to and respected (a concept virtually unheard of in schools in 1934). With great dedication, the school’s teachers balanced children’s social, emotional, physical, and creative development in an atmosphere of intellectual challenge. More than 80 years later, the same progressive principles continue to guide Green Acres today. In 2001, Louis Silvano, the Head of School at the time, had the opportunity to interview Ruth Hoge. Louis used that interview to create this video.